I got to use my new Dillon HP-1 hearing protectors for the first time today. The event was the monthly KPDL match at Knob Creek, and it was the first match I have been able to attend since the family gave me the HP-1’s for my Christmas present. It was a cool and clear March day and an excellent opportunity to address my acute case of gun smoke deprivation brought on by the cold nasty winter just passed. I was really impressed. I have begun to develop a bit of tinnitus and I also like to talk and visit when I am at a shooting match. Usually I would lift up one of the ear cups when I was trying to hear what someone was saying and invariably someone would set off a round when I had my hearing protection removed. This would cause my ears to ring for the rest of the week. I have to admit that I approached the HP-1’s with a bit of skepticism just because it was hard for me to believe that an electronic gadget could do what they promised to do: to let normal sounds through, and even amplify them, while suppressing the loud and damaging impulse of the gun report. I had heard complaints on the first generation of electronic hearing protectors, particularly that the gun report caused them to shut down completely and that they tended to quit working or not work in the first place. I have observed a lot of folks who used the first generation sets adjusting their microphone levels when the wanted to talk but then having to adjust them down again when the shooting started. Nevertheless, I have developed a certain confidence in the folks at Dillon Precision over the years. I have bought quite a few Dillon-branded products and I have yet to be disappointed. The HP-1’s are no exception. Arriving at the match, I set the microphones on the HP-1’s so that speech sounded normal. I could hear everyone plainly as if I didn’t have a headset on (or maybe slightly better). I stood about 30’ from the firing line and listened as other shooters ran the course. I could hear their guns go off with a respectable report, but the painful volume impulse was absent. I moved closer in 5’ increments, each time thinking I would have to adjust the microphones down, but I didn’t. Finally I was just behind the RO’s listening to the guns go off and there was still no damaging noise impulse but I could hear plainly every word that was being said as well as squirrels running in the leaves up on the hill. It came time for me to shoot. I didn’t adjust the mics down, but just stepped up to the line and commenced my course of fire. Again, I did not need to adjust the mics. I could hear my gun firing, but it was not loud or painful. I also noticed that I was paying more attention to my gun and my rounds going downrange. My rating on the HP-1’s: five stars. They are $130 but worth every penny for 51-year-old ears that really don’t need any more abuse. Attenuation Data for the HP1 tested in strict accordance with American Standard Institute (ANSI) Specification S3. 19-1974. 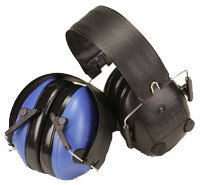 Although hearing protectors can be recommended for protection against the harmful effects of impulse noise, the Noise Reduction Rating (NRR) is based on the attenuation of continuous noise and may not be an accurate indicator of the protection attainable against impulse noise such as gunfire. Improper fit of this device will reduce its effectiveness in attenuation noise. Consult instructions for proper fit. The NRR is 20 decibels (dB). The level of noise entering the ear is approximately equal to 72 Db(A). Caution: For noise environments dominated by frequencies below 500 Hz the C-weighted environmental noise level should be used. WARNING: Attenuation will be obtained only if the device is in good condition and worn as directed. See instructions for use.